with Neil Chesterton BVSc. A Booklet and short DVD. Cost on application. If you want to build your own cow bath we can supply CAD drawings and specifications. 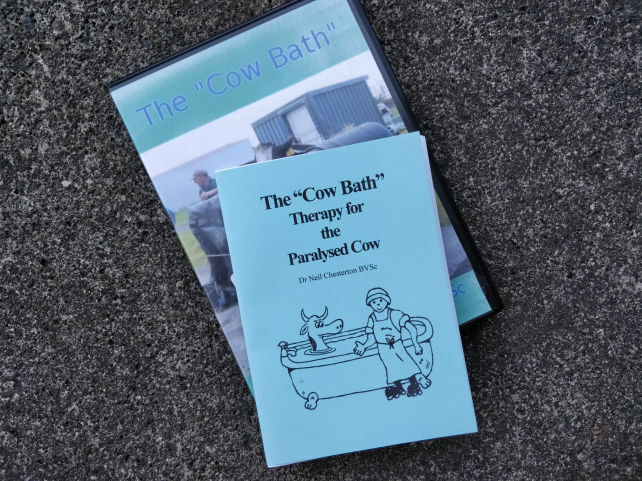 This is a booklet and DVD with all the information you will need to know about water floatation diagnosis and therapy for post partum paralysed cows. Down cows continue to be a problem on all dairy farms world wide. Whatever the cause of the cow being unable to stand, it is important that early treatment and effective nursing is employed to enable the cow to be standing and eating as quickly as possible. The cow bath is one method of lifting and nursing a down cow. It is not a magic bullet but is a very useful tool in its place.